Monsignor Donald Sakano has been the Pastor of the Basilica of St. Patrick’s Old Cathedral since 2007. Ordained a priest for the Archdiocese of New York in 1971, he has served as Director of the Department of Neighborhood Preservation, Catholic Charities from 1981 to 1994. He is the President and Chair of the Highbridge Community Development Corporation, a non-profit owner and manager of 2400 units of housing in the South Bronx. Msgr. 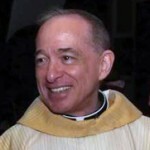 Sakano has served as the Pastor of the Church of the Holy Innocents and The Sacred Hearts of Jesus & Mary in Manhattan. He holds a Master of Divinity from St. Joseph’s Seminary and a Master’s Degree in Social Work from Columbia University.